Even if they are familiar with the acronym NPSG, many in the NHS and pharma might not be aware of what the National Pharmaceutical Supplies Group actually does. NPSG is, in fact, key to the development and delivery of a national medicines' procurement strategy to maintain the continuity of supply of medicines in England. It provides the strategic communication channel to the NHS Commercial Medicines Unit (CMU) board and the Pharmaceutical Market Support Group (PMSG), as well as to Trust chief pharmacists through their Strategic Health Authority (SHA) networks. • To agree the strategy that will inform the annual work plan, objectives and defined outcomes for the Pharmaceutical Marketing Support Group (PMSG). To understand how NPSG reached this position, it is useful to consider briefly its almost 30-year history. In 1982, during the last Conservative government, Sir Norman Fowler first created a 'Special' Health Authority, the Supplies Authority, with Bill Darling CBE as chairman. Under his stewardship and wealth of network contacts, NPSG earned a high reputation within the DH, which has been maintained for the past three decades. Members of the NPSG today include the chair of the PMSG, four CMU members and a DH representative, among others. In November 2008, the Office of Government Commerce (OGC) reported positively on medicine procurement in its Procurement Capability Review Programme and, following the publication of the DH's Necessity not Nicety report in May 2009, the Purchasing and Supplies Agency (PaSA) was transformed into the CMU in the DH. Commercial Skills for the NHS, published in March 2010, is the most recent document relating to approaches to improve value for money: it recommended a continuation of the highly regarded secondary care pharma sourcing activity. After 28 years as chair, Bill Darling CBE resigned from NPSG in March 2010. Andy Alldred, clinical director for clinical support and cancer services and the director of pharmacy at Harrogate and District NHS Foundation Trust, has been appointed in his place and will chair the first meeting of the newly reconstituted group, due to be held on June 24. Following the election of the coalition government, the NHS is bracing itself for potential further dramatic changes in, for example, its organisational structure. These developments are ushering in a new chapter in the history of NPSG, which now must change significantly to ensure that it remains relevant to the evolving needs of the NHS. A number of changes — intended to strengthen NPSG's responsiveness and relationships with the various NHS stakeholders involved in medicines procurement — have recently been made, and aim for greater input from chief pharmacists with direct responsibility for the use of medicine resources within their individual Trusts. 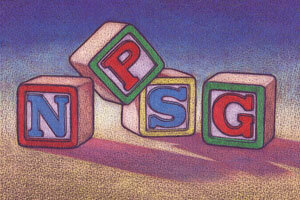 Selected members of the NPSG are also members of the Pharmaceutical Marketing Support Group (PMSG). The PMSG began life in 2004 as a means to take forward the Supply Chain Excellence Programme (SCEP), introduced in 2003 for generic contracting. Under its terms of reference the chairman is required to be a pharmacist of national standing with a known interest in pharmaceutical procurement. • To engage with all stakeholders in the supply chain on behalf of NHS Trusts to develop products, implement supply chain changes and influence pack design and product presentation in the interest of patient care, efficiency and safety. To address the increasing workload and the need to provide clear work plans for each specialist area, six PMSG strategy sub-groups have been introduced recently. They are pharmacy business technology, national homecare medicines committee, generic medicines, transitional products (those coming off patent), branded medicines and specialist medicines. The groups will invite clinical pharmacy staff to attend meetings when their area of expertise objective is on the agenda and will also work with a wide range of stakeholders to ensure that the needs of clinicians and their patients inform contractual policy and decisions. NHS hospitals in England spend around £3.6bn annually on medicines, of which around £3.0bn is spent on branded medicines — the remainder covers generics and other products, such as blood. As a result of the SCEP, the NHS now sources its generic medicines through a national work programme. PMSG was instrumental in developing this process in which products are either awarded 100 per cent across England, or to only one or more of the six SCEP regions (generally this happens for products used in secondary care). Generic prescribing has been the norm in NHS hospitals for several decades and the recent MHRA consultation on generic substitution in primary care, which ended on March 31, 2010, does not adversely impact on that practice. The Strategic Framework to Source Pharmaceuticals for the NHS in England was published in 2005 and has recently been updated: the draft will be one of the major items for discussion on the agenda of the newly reconstituted NPSG. With pressure on the NHS to make financial savings and ensure that hospitals achieve best value in relation to medicines expenditure, an increasingly important workstream for PMSG is branded medicines, which require a different strategy from that used for generics. There are, for instance, opportunities to capitalise on the therapeutic similarity of some branded medicines in order to drive competition. This requires a local approach, with clinical teams and individual prescribers working collaboratively. The London Procurement Programme (LPP) has been pursuing these opportunities successfully, but a consistent approach across the NHS is needed. • Strengthening commercial skills by the CSUs supporting clinical networks in the procurement of goods and services. The NHS is evolving and the pace of change is set to increase. In this environment it is critical that the NHS achieves best value for patient care. This requires a collaborative approach, both within the NHS and within the pharma industry. Jim Armstrong is a specialist procurement pharmacist.